An institute at the University of New Brunswick dedicated to advancing public policy research will be greatly enhanced by an announcement from the provincial government today. Through its highly secure facility on the university’s Fredericton campus, the New Brunswick Institute of Research, Data and Training has been on the forefront of data-driven research on health in the province since 2015. The Government of New Brunswick announced it will be introducing legislation to expand the range of data that can be transferred to the Institute. This will propel the province forward in the field of data research, allowing the institute to help researchers and government provide better program delivery beyond the health sector and across a wider swath of research – everything from poverty reduction to traffic safety. 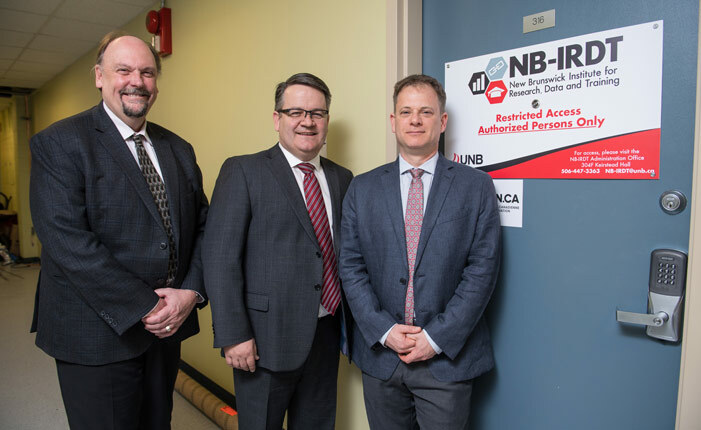 The legislative amendments to be introduced by government will enable public bodies to store prepared data sets at the New Brunswick Institute for Research, Data and Training. Prepared data is record level data that has been collected by government departments and agencies, from which all directly identifying information – such as name, address, Medicare number – has been removed. The data will be used for research purposes. The main objective is for this research to help inform the development of data-driven public policy and more cost-effective program interventions. The Information and Privacy Commissioner is supportive of the work conducted at the institute and has thoroughly reviewed the operations of the research centre. “There is a large research community in New Brunswick interested in doing policy relevant research for the benefit of our province and this will greatly expand the scope of work that can be done, while continuing to respect the privacy of citizens,” said Dr. McDonald. Researchers will only have access to the minimum amount of raw data necessary to conduct their research. In addition, the data can only be accessed in an ultra-secure facility. The computer network does not have an internet connection. Within that closed network, the New Brunswick Institute of Research, Data and Training uses a wide range of security and audit measures to ensure data are only accessed for the approved purpose. By adding data from other sources to the research centre’s area of study, New Brunswick will be able to create linked data sets that would enable researchers to find patterns and make causal connections that have never been made before. This will help the province to find new ways to address long-standing problems by better understanding the sources of such problems.